Xeeynamo's blog: Megaman X in... Emerald Hill! Yes, on last 3 days I worked on this little hack. 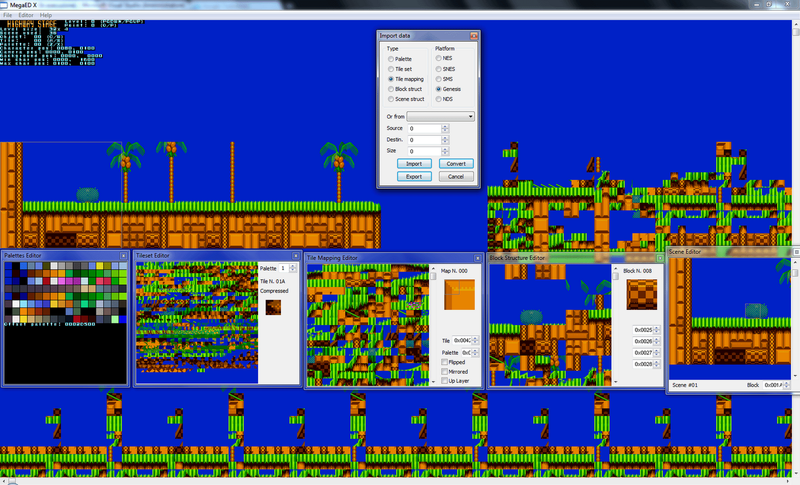 I have implemented new things on Megaman X editor like Block structure editor (32x32), Scene editor (256x256) and a simple window where you can import/export/convert palettes, tiles and other stuff and this help me to import Emerald Hill on Highway Stage. I'm able to redirect the tiles to have more free space. MegaED X still miss collision and object editor, things very important for an editor. I wanna improve some WinControl elements and clean the code (during some cleans the size of .exe was reduced of 11kb o_O now it's 86kb). I'm planning to support the reallocation of data (expanding the rom and move data) and DirectDraw/Direct3D support (now the editor use GDI that it's a bit slow). An good idea is to implement palette animation on all level but firstly I should study more the rom. When are you going to release an updated editor? He'll release it when it's ready. Don't ask, just be patient. I saw this earlier today and I was in awe. It's so strange xD; It actually fits in quite well, almost like a little beach in Mega Man.